The public, voters and non-voters alike, has a subdued reaction to the Republican Party’s midterm election victory. Four years ago, the response to the Democrats regaining full control of Congress was far more positive, as it was in 1994 when the GOP won a historic victory. Fewer people today say they are happy about the Republican victory, approve of the GOP’s plans for the future, and far fewer believe Republicans will be successful in getting their programs passed into law. The latest national survey by the Pew Research Center for the People & the Press, conducted Nov. 4-7 among 1,255 adults, finds 48% saying they are happy that the Republican Party won control of the House while 34% are unhappy. Four years ago, 60% said they were happy the Democrats won full control of Congress, compared with just 24% who were unhappy. That mirrored the public’s reaction in December 1994 to the GOP winning control of Congress for the first time in 40 years (57% happy vs. 31% unhappy). In the current survey, 52% of those who said they voted in the Nov. 2 election were happy with the outcome compared with 42% of non-voters. Still, more voters in 2006 – 60% – said they were happy with the Democrats’ victory. The public has a mixed reaction to the Republican policies and plans for the future: 41% approve, while nearly as many (37%) disapprove. Approval is somewhat greater among voters (45%) than among non-voters (35%). But on balance, both the general public and voters express less positive views of the GOP’s policies than they did of the Democrats’ proposals after the 2006 election. The public is skeptical that the GOP will be successful in getting its programs passed into law. About four-in-ten (43%) think they will be successful while 37% say they will be unsuccessful. Following the elections of 2006 and 1994, when the victorious parties gained majorities in both the House and Senate, far more people thought they would be successful in enacting their agenda (59% in 2006, 62% in 1994). There is little optimism that, in the wake of the election, relations between the two parties will improve. Just 22% expect relations between Republicans and Democrats to get better in the coming year, 28% say they will get worse, while 48% say they will stay about the same as they are now. Two years ago, after the presidential election, 37% of voters expected partisan relations to improve and just 18% thought they would get worse. Most Americans (55%) say that Republican leaders in Congress should work with Barack Obama, even if that disappoints some of their s upporters. Even more (62%) want Obama to cooperate with GOP leaders, even if that disappoints some Democrats. Independents want the two sides to work together – 57% say GOP leaders should cooperate with Obama while about as many (59%) say that the president should work with GOP leaders. 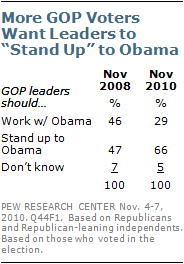 But as many Democrats say Obama should stand up to Republican leaders (43%) as work with them (46%). Republicans are even less interested in seeing their party’s congressional leaders work with Obama – and far fewer GOP voters want their party’s leaders to work with Obama than did so after the 2008 presidential election. Currently 66% of Republicans and Republican-leaning voters want GOP leaders to stand up to Obama, up from 47% shortly after the presidential election two years ago. On balance, more Americans say that Obama, rather than Republican congressional leaders, should take the lead in solving the nation’s problems. 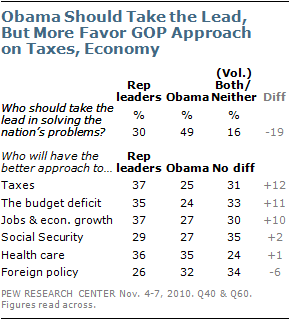 Nearly half (49%) say President Obama should take the lead, compared with 30% who say GOP leaders. Following the 2006 election, opinion on this measure was nearly reversed – 29% said President George W. Bush should take the lead, while 51% said Democratic congressional leaders. At the same time, however, the public says that Republicans will have a better approach than Obama on taxes, the budget deficit, and jobs and economic growth. On Social Security and health care, neither side’s approach is favored, while Obama holds a modest advantage on foreign policy. Americans express more conservative views about the role of government than they did just two years ago. However, when it comes to the major policy decisions that will arise in coming months, the public is closely divided. 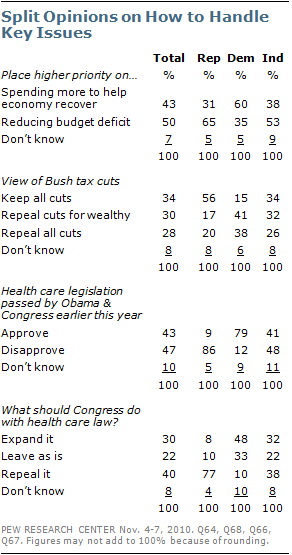 Nearly as many approve (43%) as disapprove (47%) of the new health care law, and opinions are split over what Congress should do about the legislation. Four-in-ten (40%) favor repealing the health care law, but a larger proportion (52%) says that the law should be expanded (30%) or kept as it is (22%). Opinion about what to do with the tax cuts passed during the Bush administration is divided three ways: 34% favor keeping all of the tax cuts; 30% say the tax cuts for the wealthy should be repealed while other reductions stay in place; and 28% say all the tax cuts should be repealed. More people say that if they were setting priorities for the government, they would place a higher priority on reducing the federal budget deficit (50%) than on spending more to help the economy recover (43%). Those who cast a midterm ballot are more likely than nonvoters to see reducing the budget deficit as a higher priority (55% to 41%). 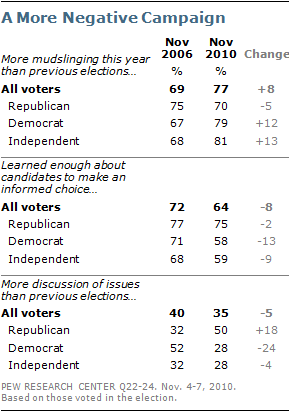 Substantial partisan gaps are evident in attitudes toward all of these issues. However, Republicans are more unified than Democrats in their views of what to do about health care legislation and tax cuts. Fully 77% of Republicans favor repealing the health care bill, while Democrats are split between expanding the measure (48%) and keeping it as it is (33%). And while 56% of Republicans favor keeping all the tax cuts, about as many Democrats favor repealing just the tax cuts for the wealthy (41%) as support getting rid of all the tax cuts (38%). These attitudes reflect a continuing difference between Republicans and Democrats over the parties’ ideological directions. Over the past two years, Republican and Republican-leaning independents have consistently favored the GOP moving in a more conservative direction. 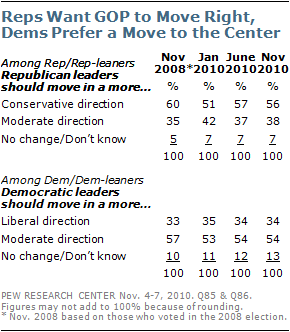 Democrats and Democratic leaners have been just as consistent in their preference that their party move in a more moderate direction. Republicans and Republican leaners who agree with the Tea Party overwhelmingly favor the GOP moving in a more conservative direction: 71% express this view compared with just 40% of Republicans who have no opinion of the Tea Party or disagree with it. 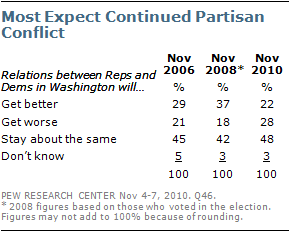 Voters express somewhat more negative views of the just-concluded campaign than they did of the 2006 midterm election. Fully 77% of voters say there was more negative campaigning or mud-slinging than in previous elections; 69% of voters expressed this view after the 2006 election. Most voters (64%) say they learned enough to make an informed choice, but an even higher percentage said this in November 2006 (72%). And slightly fewer voters say there was more discussion of issues than did so after the 2006 election (35% today, 40% then). ore attention – down from 50% who said this after the Democrats regained control of Congress in 2006. President Obama’s approval rating stands at 44%; an identical percentage disapproves of his job performance. Roughly a third of Democrats (34%) say they would like to see other Democratic candidates challenge Obama for the party’s nomination in 2012. In December 1994, far more Democrats (66%) supported a primary challenge to President Clinton. Just 16% of registered voters who attend religious services at least once a month say election information was available at their place of worship, down from 25% after the 2006 midterms. The GOP continues to be seen as a leaderless party: 51% say they don’t know who leads the Republican Party while 14% volunteer that no one does. More now see John Boehner as the leader of the GOP (10%) than did so in September (4%). There is no clear front-runner for the 2012 Republican nomination for president: Sarah Palin (15%), Mike Huckabee (15%), and Mitt Romney (13%) all receive about the same levels of support.